α-Galactosylceramide (α-GalCer) is a glycolipid with potent antitumor properties that binds to CD1d molecules and activates mouse Vα14 and human Vα24 NKT cells. Surprisingly, we found that, as early as 90 min after α-GalCer injection in vivo, NK cells also displayed considerable signs of activation, including IFN-γ production and CD69 induction. NK activation was not observed in RAG- or CD1-deficient mice, and it was decreased by pretreatment with anti-IFN-γ Abs, suggesting that, despite its rapid induction, it was a secondary event that depended on IFN-γ release by NKT cells. At later time points, B cells and CD8 T cells also began to express CD69. These findings identify a high-speed communication network between the innate and adaptive immune systems in vivo that is initiated upon NKT cell activation. They also suggest that the antitumor effects of α-GalCer result from the sequential recruitment of distinct innate and adaptive effector lymphocytes. Although NK and NKT cells belong to distinct lineages, they present striking similarities such as the expression of the same set of NKR-P1 and Ly49 receptors and the ability to release massive amounts of cytokines with extreme celerity and without prior sensitization, including IFN-γ for NK cells, and IFN-γ and IL-4 for NKT cells. In addition, they both constitute relatively large populations, on the order of 1–30% of total lymphocytes in different tissues (reviewed in ref (1, 2, 3). NKT cells use semi-invariant TCRs (4) to recognize glycolipids, such as α-galactosylceramide (α-GalCer)3 presented by CD1d molecules (5). In addition, cytokines such as IL-12 can stimulate both NK cells (6) and NKT cells (7, 8) to release IFN-γ and express natural cytotoxicity. The rapid activation of both these populations is characteristic of innate immunity and probably serves two purposes: to provide a first line of defense against pathogens and to orient the adaptive immune response into the appropriate effector pathway according to the nature of the pathogen. NK and NKT cells have been implicated in a wide spectrum of conditions. NK cells play a role in viral infections, especially of the Herpes virus type, and can also function against intracellular pathogens and tumors. NKT cells exert regulatory functions, most likely through their capacity to promptly release large amounts of IL-4 to orient responses in a Th2 direction (9, 10). NKT cells can prevent type 1 diabetes in the nonobese diabetic (NOD) mouse (11, 12) and possibly also in humans (13), and participate in a variety of responses against infections (14, 15). However, recent studies have generated some confusion with regard to the respective roles of NK and NKT cells. Effector functions against tumors, originally attributed to NK cells, have been ascribed to NKT cells (8, 16), and conversely some immunoregulatory functions, such as those exerted upon experimental autoimmune encephalomyelitis (17) or eosinophilic airway disease (18), have been associated with classical NK cells rather than with NKT cells. These reports led us to consider the possibility that NK and NKT cells might be functionally linked in vivo, the activation of one leading to the activation of the other, thus explaining the ambiguity in the definition and apportioning of their roles. To test this idea, we took advantage of the ability of α-GalCer, a synthetic glycolipid (2S,3S,4R)-1-O-(α-d-galactopyranosyl)-2-(N-hexacosanoylamino)-1,3,4,-octadecanetriol) (KRN 7000) to stimulate essentially all mouse Vα14 and human Vα24 NKT cells (5, 19, 20). α-GalCer is chemically and functionally analogous to natural glycolipids that were first purified from marine sponges on the basis of their antitumor properties against the mouse B16 melanoma (21, 22, 23). Our experiments indicate that NKT cells can transactivate NK cells at a surprisingly high speed upon stimulation with α-GalCer in vivo. Furthermore, the network of activation initiated by NKT cells extends, with some delay, to B cells and T cells as well. Six- to 12-wk-old C57BL/6J (B6) mice, raised and maintained under strict specific pathogen-free conditions, were used throughout these experiments. B6.RAG−/− and B6.TCR Cα−/− mice were purchased from The Jackson Laboratories (Bar Harbor, ME). B6.CD1−/− mice were generated in our own laboratory from a targeted embryonic stem cell of 129 origin (S.-H. Park and A. Bendelac, manuscript in preparation) and used at the seventh backcross generation onto B6. For intracellular detection of IFN-γ in NK cells, spleen cells were first surface-stained with PK136-FITC or DX5-FITC and CD3-Cychrome or CD5-Cychrome (all from PharMingen, San Diego, CA) at 4°C for 20 mn, then fixed for 5 min in PBS with 4% paraformaldehyde and permeabilized for 30 min in PBS containing 0.1% saponin and 5% skimmed milk before staining for 30 min with anti-IFN-γ-PE (XMG1.2; PharMingen) diluted in PBS-saponin-milk, as described (24). For studies on CD69 induction, B220-FITC, CD8-PE, CD4-APC, and CD69-biotin were from PharMingen, and streptavidin-Tricolor was from Caltag (San Francisco, CA). Cell were analyzed for fluorescence using a FACScan, FACScalibur or FACS Vantage and the CellQuest software (Becton Dickinson, San Jose, CA). Mice were injected i.v. with 10 μg of α-GalCer and their spleen cells collected at different time points, from 90 min to 6 h after injection. α-GalCer was diluted in PBS from a 220 μg/ml stock solution in 0.5% polysorbate solvent. Controls were injected with a corresponding dose of solvent. For in vivo blocking of cytokines, mice were injected i.p. with 1 mg of purified Ab against IL-4 (11B11), or IFN-γ (RA4-6A2 or XMG1.2) for 16–24 h before the injection of α-GalCer. 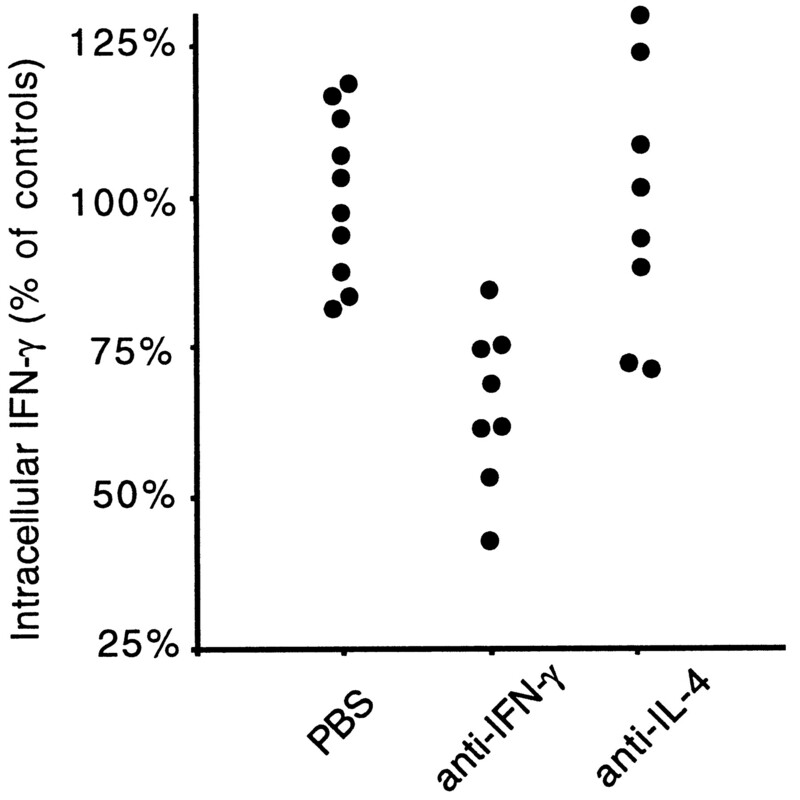 The use of RA4-6A2 in some experiments of in vivo IFN-γ blocking was to avoid potential interferences with intracellular staining of IFN-γ with XMG1.2, as these mAbs do not compete for binding IFN-γ. In the experiment shown in Fig. 1⇓, mice were injected with 10 μg of α-GalCer and killed after 1.5, 3, or 6 h. The spleen cells were immediately incubated at 4°C with mAbs specific for cell surface receptors, then processed for intracellular staining by fixation/permeabilization followed by incubation with anti-IFN-γ mAb. By using a highly fluorescent PE-conjugated anti-IFN-γ mAb, we were able to detect IFN-γ in the cytoplasm of activated cells directly ex vivo, without prior exposure to brefeldin A in vitro, as is usually required for the detection of intracellular cytokines (24). Thus, the results described below reflect purely in vivo events. 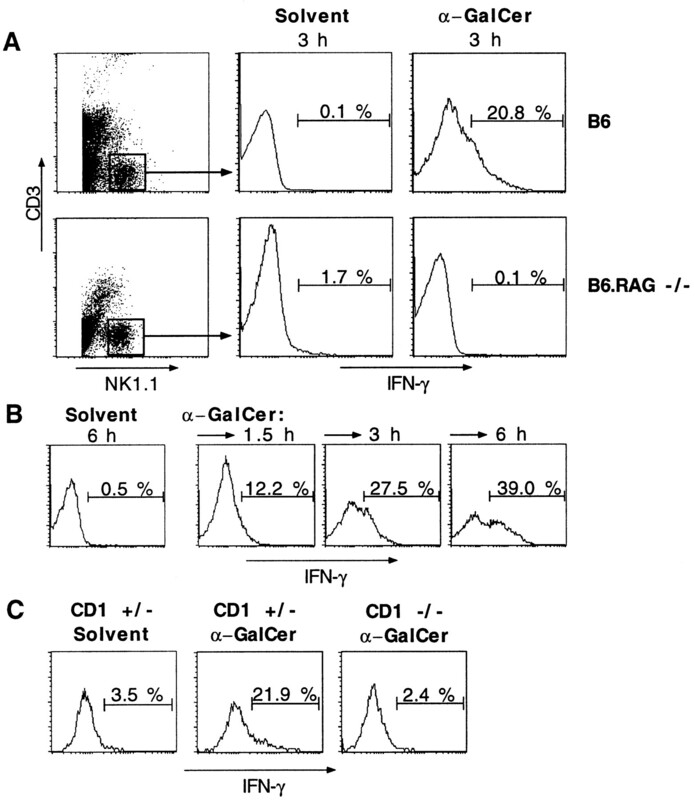 Rapid induction of IFN-γ by NK cells of α-GalCer-injected mice. A, Comparison of normal vs RAG-deficient B6 mice. 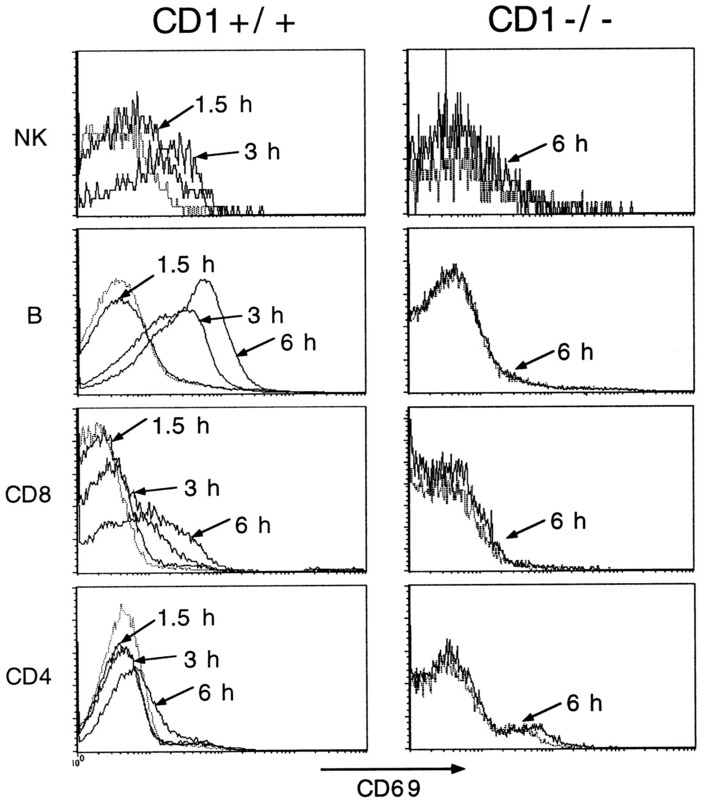 NK cells are gated as CD3-negative NK1.1-positive cells as shown in the dot plots, and their intracellular IFN-γ content, as measured by flow cytometry, is displayed in the histograms. To analyze sufficient numbers of NK cells, most NK1.1-negative cells were gated out during data acquisition. B, Kinetics of IFN-γ production by NK cells of normal B6 mice. C, Lack of NK cell activation in α-GalCer-injected, CD1-deficient mice (3 h time point). Surprisingly, NK cells, which were clearly identified as CD3-negative NK1.1-positive cells, were found to produce detectable amounts of IFN-γ as early as 1.5 h following α-GalCer injection (Fig. 1⇑, A and B). The levels continued to rise until the 6 h time point, where a large fraction of NK cells, ranging from 30 to 50% in different experiments, were found to produce high levels of IFN-γ. The IFN-γ staining profile was often bimodal, indicating that only a fraction of NK cells were receptive or were receiving the activation signals. NKT cells could not be satisfactorily resolved in these experiments for technical reasons: they express levels of NK1.1 that are 2–3 times lower than NK cells, and the fixation/permeabilization technique that allows for intracytoplasmic staining of cytokines significantly reduces the level of NK1.1 staining, thus preventing clear-cut resolution of these NK1.1low T cells. In addition, although cells in the CD3+NK1.1low double-positive area of the FACS dot plots were found to produce IFN-γ as well as IL-4 (data not shown), this region contains artefactual dots that preclude a rigorous analysis. This is particularly evident in the RAG-deficient mice (see Fig. 1⇑A, lower left panel), which do not contain CD3-positive cells yet display some CD3+NK1.1+ double positive dots that result in part from the fixation/permeabilization procedure. On the other hand, we eliminated the possibility that the CD3-negative NK1.1-positive, IFN-γ-producing cells were NKT cells that had down-modulated their TCR because we obtained identical results with other staining combinations using anti-CD5, which is positive on NKT cells and negative on NK cells, and DX5, which is positive on NK cells and negative on NKT cells (25) (data not shown). Furthermore, IFN-γ producing cells with the CD3-negative NK1.1-positive surface phenotype were also negative for intracellular anti-CD3ε staining (data not shown). RAG-deficient mice have a functional NK cell compartment and normally express CD1, the α-GalCer presenting molecule. However, their NK cells did not produce IFN-γ after the injection of α-GalCer (Fig. 1⇑A). A similar result was obtained with TCR Cα-deficient mice (data not shown). Thus, despite its very high speed, NK cell activation appears to be a secondary event that requires and follows the prior activation of another cell type, likely to be the NKT cell. Indeed, in CD1-deficient mice, which selectively lack NKT cells, NK cells failed to produce IFN-γ (Fig. 1⇑C). This defective NK cell activation was not due to some intrinsic NK cell defect, because NK cells of CD1-deficient mice could be normally activated in vivo as well as in vitro by other stimuli, such as poly(I:C), an inducer of YAC-1 cytotoxicity, and the combination of ionomycin and PMA, a potent inducer of IFN-γ secretion (data not shown). Altogether, these results indicate that NK cells are transactivated very rapidly as a consequence of α-GalCer-induced activation of NKT cells. NK cells, which constitutively express low levels of CD69, an early activation marker, started to up-regulate CD69 within 1.5 h of α-GalCer injection, reaching peak levels at 3 h on >50% of the cells (Fig. 2⇓). This induction of CD69, was abolished, as expected, in the CD1-deficient mice. Widespread up-regulation of CD69 after in vivo injection of α-GalCer. CD69 profiles of gated NK, B, CD4, and CD8 splenocytes are shown at various time points ranging from 0 (light line) to 6 h in CD1+/+ and CD1−/− B6 mice. The 6-h time point for NK cells in the CD1+/+ mouse is superimposable on the 3-h time point and is omitted for clarity. Surprisingly, we found that B cells also up-regulated CD69 in a significant manner. The kinetics were delayed compared with NK cells, the process beginning only at 3 h and reaching >60% of the splenic B cell population by 6 h (Fig. 2⇑). CD1-deficient mice (Fig. 2⇑) and TCR Cα-deficient mice (data not shown) failed to up-regulate CD69 on B cells, indicating again the need for prior activation of NKT cells. In addition, some induction of CD69 was also observed on CD8 cells and, to a lesser degree, on CD4 cells (Fig. 2⇑). Thus, the lymphoid populations that seem most affected by the activation of NKT cells are, in chronological order, the NK cells and the B and CD8 cells. The very high speed of the transactivation of a large subset of NK cells after α-GalCer-mediated activation of NKT cells suggested that NK cells might directly respond to the cytokines that are immediately released by activated NKT cells. To test this hypothesis, mice received 1 mg of neutralizing Abs against IFN-γ or IL-4, two prominent cytokines released by NKT cells, 16–24 h before the injection of α-GalCer. Fig. 3⇓ shows that there was a substantial, though not complete (35% on average) reduction of intracellular IFN-γ after in vivo blocking with anti-IFN-γ, but not with anti-IL-4 Abs. A similar pattern of partial inhibition of CD69 induction was observed after anti-IFN-γ treatment and in IFN-γ knockout (KO) mice (data not shown). Thus, the communication between the two NK subsets involves IFN-γ, but other factors, such as additional cytokines and/or surface receptors, may also be required to achieve full activation. Cytokine dependence of NK cell activation. Mice were injected with 1 mg of neutralizing anticytokine mAbs or PBS 16–24 h before injection of α-GalCer. Each dot represents the intracellular IFN-γ content of NK cells, measured by flow cytometry and normalized as the percentage of the average fluorescence intensity in control, PBS-injected mice in the same experiment. Results are pooled from four separate experiments. Because the antitumor effect of α-GalCer was absent in Jα281-deficient mice (16) that lack NKT cells, it was suggested that activated NKT cells might directly kill tumor cells. However, and in accordance with previous reports that α-GalCer-injected tumor-bearing mice had increased levels of natural cytotoxicity mediated by “classical” NK cells (26, 27), our studies now reveal a more complex scenario involving other potential antitumor effectors such as NK cells, as well as CD8 T cells and B cells. Each of these has the potential to contribute to tumor rejection. In conclusion, we show that in vivo engagement of NKT cells by their glycolipid ligand rapidly induces a cascade of cellular activation that involves elements of innate and adaptive immunity and may have far reaching consequences not only on the speed and strength but also on the type of subsequent immune responses, in particular those directed against tumor cells. We thank Calman Prussin for expert advise with intracellular cytokine staining, Olivier Lantz and Polly Matzinger for reviewing the manuscript, and Lisa Antonucci for managing the mouse colonies. ↵1 This work was supported by funds from the Institut National de la Santé et de la Recherche Médicale, from the National Institutes of Health (RO1 AI38339, ACS IM 788, and JDFI 197004), and a Cancer Research Institute Investigator Award (to A.B. ).